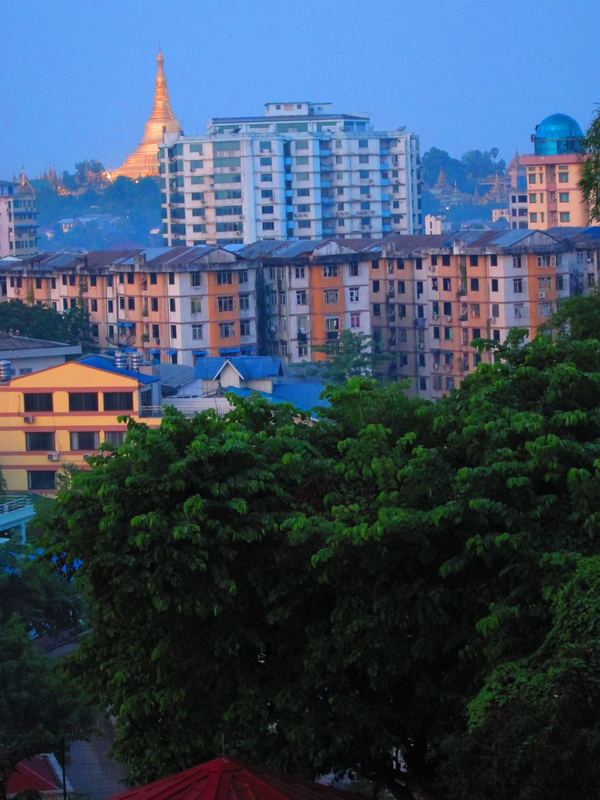 The 5am view from our apartment in Yangon. Shwedagon Pagoda in the background. It’s 5am…again. I hate 5am. The world is a seething cesspool of hate, despair, and frustration at 5am. Here in the so-called winter of southern Sweden, the sun doesn’t even rise for another three hours. There are no pleasant tendrils of pink creeping over the eastern sky bringing the promise of a beautiful day. All we have is the wind and rain whipping at the trees and filling you with dread at the prospect of keeping a three year old dry and grit free as they are bound to spend multiple hours outside for recess. It’s 5am and M is demanding, in that dreadful banshee wail of his, to be taken from his crib and fed. “Good morning hemmapappa, feed me.” Does this boy not understand that I am a night owl, not a morning bird? I have been my whole life but not one of my boys seems to respect the fact that I prefer to let the sun rise unaided by my bloodshot weary eyes. The sun can manage perfectly on its own; we don’t need to witness it every damn morning. It’s 5am and I am shoveling cereal into the hungry maw of my one-year-old son. I have kept the light off in the futile hope that he might want to go back to sleep after I have fed him, it has happened once or twice, enough to give hope without the consistency to be reliable. It’s 5am…six months ago. The sky was full of a multitude of pinks and reds and light blues as the morning rays of the sun chased the gloom of the night away. I hold M close to me as we both peer in wonder at the magical shift between day and night in our new home of Sweden. I whisper the secrets of the world to my son and treasure these moments we have together, just the two of us. It’s 5am…two and a half years ago. My son K sits on my lap as we share a banana and witness the wonder of the morning sun strike the golden dome of Shwedagon Pagoda in Yangon. The first sounds of morning traffic drift up to our apartment as the old Chinese busses honk their way up and down the road mixed with the ring-ring-ring of the trishaw bells and the morning call of wandering vendors out for an early start. This is our time, father and son, taking in the mysteries of the world as I whisper the meaning of life into his ear and explain the love I have for him. It’s 5am…the sharp scent of freshly percolated coffee permeates the air. Before my wife became pregnant with K, I did not drink coffee, but I had a feeling that with fatherhood, I would need the assistance of caffeine to get me going. Over the course of her pregnancy, I slowly introduced coffee into my system allowing the addiction to take hold. Over the past three and half years, not a morning has gone by without the consumption of the bitter black tempered with a shot of chocolate milk and cooled by one quickly dissolving ice-cube. If I happen to miss my morning cup of coffee the day will attack me with a headache that just can’t be dispelled, until the caffeine is delivered again. It’s 5am…three and half years after my first son was born. I am tired of 5am. I just want to sleep peacefully until 7am, to wake up and see that the sun made it up once again and is casting its merry pink glow through our windows, and it did it all by itself. 5 a.m. – uggh. You almost make me feel good that my alarm goes off at 5:36. I still don’t like coffee. The need for an alarm would be nice. Right when my older boy started to sleep to a reasonable hour, the second came along and ruined any hope of sleeping through to 7am. That’s G-d’s way of keeping the population down.